How to create a simple table flat lay. 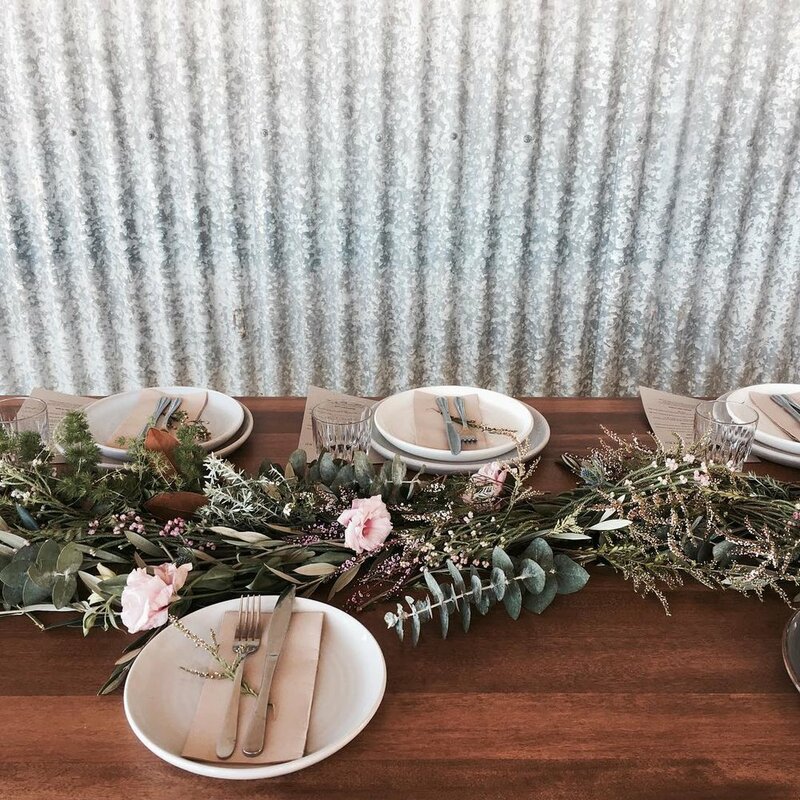 Table lays are a perfect way to quickly and effectively dress a table for dinner parties, weddings or functions. You can use a wide range of flowers, greenery, fruits, vegetables, nuts, branches, husks and seed pods. Greenery such as olive, rosemary, camellia, ferns, magnolia, eucalypt, wax etc. Fresh seasonal blooms eg roses, disbuds, cymbidium orchids, phal orchids, banksias, proteas, natives. Fruits, vegetables and pods eg pears, artichokes, grapes, figs, beetroot, radish, broccoli, lotus pods, succulents. Step one. Before you start think about the style and theme of the setting eg. is it a baby shower which will be more feminine or your husbands birthday which will be more earthy and natural. This will help you select products to suit. Next scan your garden or local area for anything that you could use that will last the night eg. rosemary, camellia foliage, magnolia foliage, olive leaf, persimmons on branches etc. step two. Now pick, forage and buy your desired products and don't forget to incorporate something like figs, pears, grapes, seed pods, artichokes or radishes. They will help to create a more textured, abundant table and will compliment the food perfectly. step three. Now slightly trim your foliage into medium size straighter pieces that will easily lay flay down a table, they don't have to be all the same as a little bit of wild is always beautiful. Lay your greenery down the center of your table, one product at a time until the center of your table is looking abundant. Then poke in your flowers into clumps along the table, slightly weave their stems under the foliage so you can just see their heads poking out. step four. Now lastly add your pods, fruit, vegetables, or other earthy textures to the table as highlights. You don't need to fill every gab just place them in a few section s throughout the table lay. step five. Now give your flat lay a small spry with water and stand back and admire your work. Your guests will love this natural, relaxed floral display and will appreciate the chance to have a little nibble on the fruit too. Step one. You'll need to select the right type of flowers to dry as not all blooms are perfect for drying. The best way to tell if your flower will be a beautiful end product is to choose flowers with woodier, no watery stems for eg. roses, natives, herbs etc. My favorite dried flowers are roses, eucalyptus, gum nuts, gypsophila, hydrangea, paper daisies & banksias. step two. Now that you've selected your product begin the drying process slowly, slower the better. keep product stems in minimal water for 7-10 days then when the blooms begin to look like they are finished being fresh it is time to remove from them from the water & completely dry stems. step three. Now tie some twine around bundle of blooms and hang in a warm dry place for 1-2 weeks until full dry. My blooms dry best on our tin shed wall or by my kitchen window of my home. step four. Once your blooms are fully dried you can taken them down and arrange them into bottles, vases, wall hangings, into baskets etc. My personal favorite is to hang them from the wall or ceiling to create an earthy natural feel to your home. Your dried flowers will now be good for many years to come, its a fantastic way to re purpose wilted flowers or preserve garden flowers or foliage you may have plenty of in a particular season.